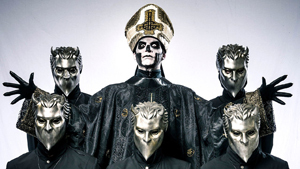 In addition to their support slot for metal masters IRON MAIDEN during the band's North American tour this Summer, ghoulish rockers GHOST have announced some special headline shows. Pre-sale tickets for the 13 headlining dates are available for purchase now. Tickets will be available to the general public beginning this Friday, March 31st at 10 AM local time. GHOST also recently announced that a special VIP Upgrade Package will be available at all upcoming dates with IRON MAIDEN, which includes early VIP entry, a pre-show meet and greet, collectible items, and more. See below for a complete list of upcoming live dates.